Columbus Zoo and Aquarium’s newest exhibit, Stingray Bay, opened to the public on Monday, June 18. Located in Jungle Jack’s Landing (near the front entrance and adjacent to Zoombezi Bay), Stingray Bay is an 18,000 gallon, shallow, saltwater touch pool within an open-air shelter that gives guests a hands-on experience with this aquatic animal. Zoo staff (or interpreters) are stationed around the exhibit to answer questions and share facts about the stingrays. The exhibit is made up of a few dozen Cownose Rays and Southern Stingrays. Typically, these creatures are bottom feeders. They have molar-like teeth that are used to crush the shells of their prey (crustaceans, mollusks, and other invertebrates). The rays are fed a variety of seafood several times a day, and guests can watch or participate in the feedings. Though stingrays may have a less than stellar reputation, it is stressed that visitors should not be afraid of them. In all actuality, these animals are quite harmless and only use their barbs for defense purposes. However, the rays in the exhibit have also had their barbed tips removed to ensure safety. Cownose rays get their name from their unique forehead, which is similar to a cow’s nose. 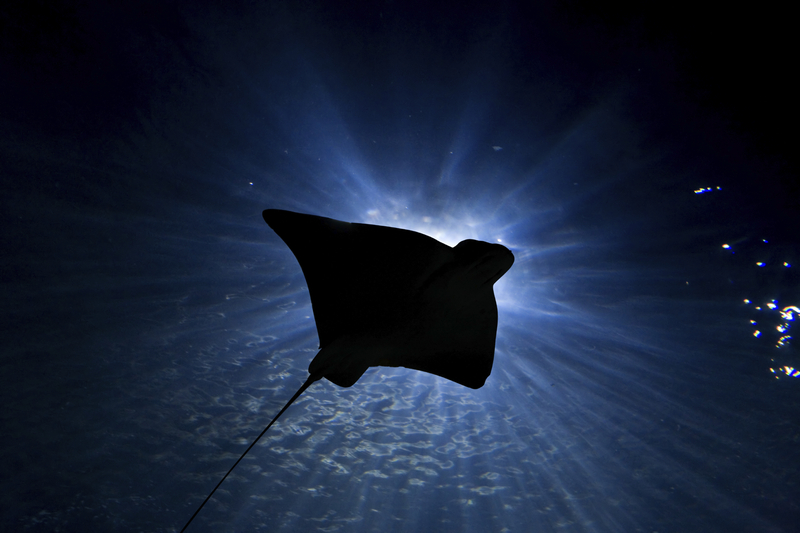 Cownose rays’ bodies are shaped like kites and look like they are flying through the water. Southern stingrays are often found buried in the sand, with only their eyes and spiracles showing. Southern stingrays not social, so they are often seen alone or in pairs. Stingray Bay is open from 10 a.m. to 7 p.m. It is a timed-ticket exhibit. There is a small charge to enter the exhibit (not included in regular Zoo admission rates*): $2 for Columbus Zoo members and season pass-holders and $3 for non-members. Guests can also purchase 1 cup of food for the rays for $2. *Coming to the Zoo this summer? Save up to 30% off gate admission rates with the Dublin CVB’s “Kids Eat Free Columbus Zoo/COSI Summer Getaway” package. Go HERE to learn more.